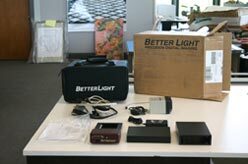 BetterLight Super 6K scanning back arrives at the FLAAR evaluation center for testing by Nicholas Hellmuth. 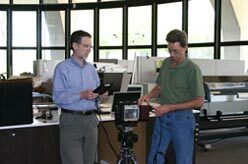 The FLAAR Photo Archive was selected as beta tester for the original BetterLight prototype several years ago. 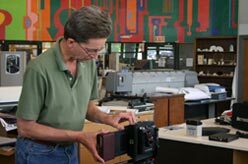 Following upon the success of these tests Calumet Digital and Better Light arranged for the newest Super 6K scanning back to be delivered to the St. Louis office of FLAAR. We test and evaluate the BetterLight Super 6K-HS large format digital camera system every year so we can update our tips, information, and reviews. 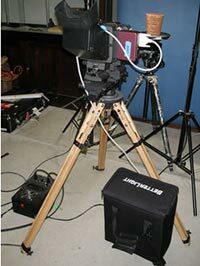 We are currently testing this large format digital scanning back on location in Guatemala. The software has advanced considerably in the last four years. We also have the Dicomed FieldPro, originally manufactured by BetterLight and sold in the late 1990's by Dicomed. The BetterLight Super6K is improved in all respects, both hardware and software. Some manufacturers and distributors send older demo models that are often defective before they even arrive. BetterLight back, Cambo Ultima front, Ries wooden tripod. The Maya vase is held by Gitzo tripod and Manfrotto tripod head from BogenImaging (available from Calumet Photographic). Lights by NorthLight. 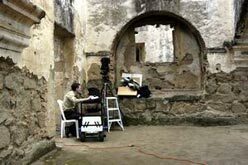 This is part of the FLAAR studio for photographing archaeological artifacts in the Museo Popol Vuh, on the campus of the Universidad Francisco Marroquin. Calumet realized that reviewers like to see what a brand new system looks like in its original packing. After all, this is the way the actual photographer will first see his or her brand new Better Light. Better Light certainly does a professional job on their custom packing. I believe even that the box was double-boxed (the best way to ship equipment, one box inside another outer box). A portability option has always been available. For early versions you just add any Macintosh PowerBook laptop computer. The "Wallstreet" G3 model is what we started with, or any Mac laptop such as the older 3400, since all of these still had SCSI built in. Newer Mac laptops require an Ultra SCSI card from Ratoc. This causes constant conflicts with the Mac OS but after struggling for several years we finally got it to work on a G4 Titanium laptop. The newer models of BetterLight use USB-2. They are significantly faster, smaller, and don’t weigh as much as the original models that we have. But it is worth pointing out that our Dicomed version of the BetterLight worked for years and the replacement, the BetterLight Super 6K has also worked for years, in a harsh tropical environment. So not only is the BetterLight portable, it holds up to using it out on expeditions. Contact is Mike Collete at info@betterlight.com. Images from BetterLight Super 6K-HS large format digital camera being printed in Lienz, Austria at the manufacturing plant of the Durst Rho 800 Presto, a combo style UV-curable ink flatbed printer. Remarkable late afternoon shadows on the 17th century Spanish colonial cloisters of Sta. Clara, Antigua Guatemala (Central America), about 30 miles from the FLAAR offices. With architectural history of this magnitude, now you know why we like to be in Guatemala. It took 3 years to take this photo: the first two field trips did not have good enough weather to capture this kind of dramatic sky. This year we waited 7 hours for the sky to clear to reveal these colors. Pano photo by Nicholas Hellmuth and crew (Eduardo Sacayon with help of Luis Fernando Corboda; Photoshop accomplishments to pull detail out of the shadow areas by Elsa Morales, FLAAR. Photo copyright 2003 by FLAAR. Most recently updated Jan. 19, 2006.